GoPro has been in the news a lot lately because of its falling stock price, but don’t count this company out yet because its cameras are still the best. HERO5 Black is the most powerful, easy-to-use GoPro with a 2-inch touch display, simplified controls and video resolutions up to 4K at 30 frames/second. You simply won’t find a better holiday gift for your active friends who would love professional quality video of their outdoor experiences. 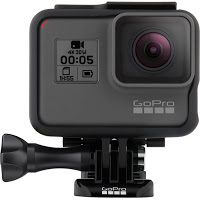 This GoPro is waterproof without a housing to 33 feet and boasts advanced wind and noise reduction.